Whoopi Goldberg was born Caryn E. Johnson in New York City around 1955 (some reports say 1949 or 1950), the first of Emma Johnson's two children. Her father abandoned the family, and Goldberg's mother worked at several different jobs, including as a nurse and teacher. Goldberg began acting in children's plays with the Hudson Guild Theater at the age of eight and spent much of her free time watching movies, sometimes three or four a day. "I liked the idea that you could pretend to be somebody else and nobody would cart you off to the hospital," Goldberg explained to Cosmopolitan 's Stephen Farber. During the 1960s Goldberg dropped out of high school and became addicted to drugs. Finally she sought help, cleaned herself up, and, in the process, married her drug counselor. A year later Goldberg gave birth to a daughter, Alexandrea. Less than a year after that, she was divorced. During this time she worked as a summer camp counselor and as a member of the choruses of Broadway shows such as Hair and Jesus Christ Superstar. In 1974 Goldberg headed west to San Diego, California, pursuing her childhood dream of acting. She performed in plays with the San Diego Repertory Theater and worked with a comedy group called Spontaneous Combustion. To care for her daughter, she had to work as a bank teller, a bricklayer, and a funeral home assistant. She was also on welfare for a few years. During this period she went by the name "Whoopi Cushion," sometimes pronouncing her name "ku-SHON" as if it were French. After her mother pointed out how ridiculous the name sounded, Goldberg changed it. Show. She performed the show first on the West Coast, then toured the rest of the country and Europe in the early 1980s before ending up in New York City. These performances caught the attention of film director Mike Nichols (1931–), who offered to produce her show on Broadway in September 1984. In 1985 director Steven Spielberg (1946–) offered Goldberg the lead role in The Color Purple, her first film appearance. Goldberg received a Golden Globe Award and was nominated (her name was put forward for consideration) for an Academy Award for her performance. Goldberg's fortunes continued to rise. 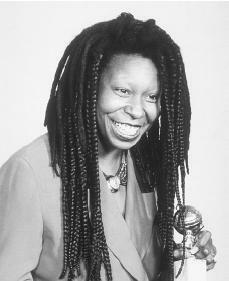 In addition to her film awards, she won a Grammy Award in 1985 for her comedy album Whoopi Goldberg and received an Emmy nomination the following year for her guest appearance on the television show Moonlighting. The increased exposure, recognition, and acceptance allowed Goldberg to pursue social activities, focusing on issues that affected her when she required public assistance, which she has tried to call attention to since her early days in show business. Beginning in 1986, along with Billy Crystal (1947–) and Robin Williams (1952–), Goldberg hosted the annual Comic Relief benefit that raises money for the homeless through the Health Care for the Homeless project. Goldberg also appeared before Congress to oppose proposed cuts in federal welfare, in addition to speaking out on behalf of environmental causes, the nation's hungry, acquired immune deficiency syndrome (AIDS; a disease that attacks the immune system), drug abuse awareness, and women's right to free choice. She has been recognized with several awards for her efforts. This increased exposure, though, did not lead to increased success for Goldberg, as she went on to star in a series of poorly received movies, including Jumpin' Jack Flash, Burglar, Fatal Beauty, The Telephone, Clara's Heart, and Homer and Eddie. It seemed that as quickly as she had risen, she had fallen. Goldberg became the subject of gossip and rumors that Hollywood was ready to write her off. She remained steady, though, ignoring bad reviews and criticism. "I've just stopped listening to them," she told Paul Chutkow in Vogue. "I've taken crazy movies that appeal to me. I don't care what other people think about it. If it was pretty decent when I did it, I did my job." Goldberg needed to find the right film to highlight her comic approach in combination with social and humanitarian (promoting human welfare) elements. Her chance came with the 1990 film Ghost. Although not all critics liked the film, most critical and popular response was positive, especially regarding Goldberg's performance as the flashy but heroic psychic, Oda Mae. She had spent six months persuading studio executives that she was perfect for the part, and her hard work paid off: Ghost made more money than any other film released in 1990. In addition, Goldberg won an Oscar for her performance, becoming only the second black female in the history of the Academy Awards to win such an honor. Goldberg's next role was in a drama, The Long Walk Home. She also continued her television work. Beginning in the 1988 and 1989 season, she appeared off and on as a crew member on Star Trek: The Next Generation, and in 1992 she hosted her own talk show. In 1992 alone Goldberg appeared in three films: director Robert Altman's (1925–) The Player; the comedy Sister Act, one of the biggest box-office hits of the summer; and Sarafina: The Movie, a film version of the musical about black South African teenagers' struggle against apartheid (South Africa's policy of keeping the races separate). Goldberg also appeared in Made in America, Sister Act II (for which she was paid eight million dollars), Corrina, Corrina, and Boys on the Side. Goldberg took a break from acting to host the Academy Awards in 1994 and 1996, becoming the first African American and first female to host the event solo. More than one billion people worldwide saw the awards show and critics praised her performance. In 1996 the academy faced public protest by the Reverend Jesse Jackson (1941–) regarding the lack of African American voters and award nominees. Goldberg joked that she would have worn Jackson's ribbon of protest, but she knew he was not watching. In 1997, after appearing in a comedy called The Associate, Goldberg left Hollywood and returned to theater, starring on Broadway in a production of A Funny Thing Happened on the Way to the Forum. She continued to appear in films, including The Deep End of the Ocean and Girl, Interrupted, both in 1999, and on television on the game show Hollywood Squares. She hosted the Academy Awards again in 1999 and 2002. In 2001 she received the Mark Twain Prize for American Humor from the Kennedy Center for the Performing Arts in Washington, D.C.
Caper, William. Whoopi Goldberg: Comedian and Movie Star. Springfield, NJ: Enslow Publishers, 1999. Gaines, Ann Graham. Whoopi Goldberg. Philadelphia: Chelsea House, 1999. Katz, Sandy. Whoopi Goldberg. Philadelphia: Chelsea House, 1997. Parish, James Robert. Whoopi Goldberg: Her Journey from Poverty to Megastardom. Secaucus, NJ: Carol Pub. Group, 1997. There are several good aspects to the radio material I hear on the Bay Area station, KKSF. Congratulations! I still believe in a story plot for that Sci-Fi tv show that I sent in: the story where Ms. Goldberg's character is mirrord by an exact duplicate, although the duplicate sports a mini-skirt type uniform, and commands a starship. I think it would be an interesting sub plot for a theater film or a whole tv episode. This is not representative of twisted exploitive thinking. It may grant Ms. Goldberg much more "mula" for poker games! Whoopi Goldberg is one of the most admired actresses and also one of the smartest peopl on any talk show. She is admirled by so many,, I don't understant why y ou are cancelling her show.. UNLESS the far right is helping to cancel it..
She is a wonderful person and more people should be like her. Whoopi Goldberg is one of the best African American. She's even in THE VIEW. I'm even doing her in school. The lion king is one of the best African. She is cancelling her life.